Apple is known for spearheading change through elimination: it radically axed disc drives from Macs, replaced physical keyboards with touchscreens on phones and made Ethernet ports an optional accessory. All of these were unconventional in their day. Six years ago, the MacBook Air lead to people worrying about losing the bulky, humming DVD drive that takes up 1/3 of a laptop's footprint. Today's iPad Air 2 and iMac event was no different. The Cupertino company is modernizing - for the better - many of the tasks we use in everyday life. You may not have noticed the changes during the press conference, but you'll surely see the differences years down the line if they're successful. Apple Pay begins to replace the swipe and sign routine of using credit cards on October 20 in the US. You just need a fingerprint and the latest iPhone. There's no plastic involved when using an iPhone 6 or iPhone 6 Plus as a mobile wallet. The same can't be said about many of the popular plastic Google Wallet-linked Android phones. Apple has enlisted 500 banks and the three major credit card companies: Visa, Mastercard and American Express. In addition to its Apple Stores, top-name retailers like McDonald's, Walgreens, Whole Foods, Subway, and Disney theme parks are going to accept Apple Pay. iOS 8.1 is going launch Apple Pay, but it'll also be used to fix those nasty Wi-Fi and battery drain problems too. These annoying bugs were introduced in iOS 8 and made worse when a handful of people upgraded to iOS 8.0.1 before it was pulled. iOS 8.0.2 quickly took its place with some fixes. More than any of the product announcements, Monday's iOS 8.1 may be a welcomed change for users facing issues with their current hardware. 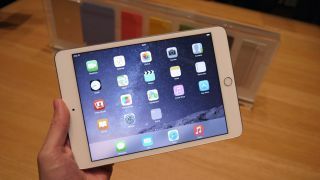 The iPad Air 2 isn't "as thin as a pencil" like last year's iPad Air. It's actually 18% thinner. At just 6.1mm, it's now the world's thinnest tablet and it's super light too. iPad Air 2 weighs under a pound at 0.96 lb.. (437 g). Compare that to the original iPad at 1.5 lb. (680 g). Apple eliminated the gaps between its three layers: the glass, the touch sensor and the LCD, making it thinner and sharper than previous iPads. Like the iPhone 6 and iPhone 6 Plus, there's no longer a 32GB option being offered within the iPad Air 2 and iPad mini 3 lineup. It's been eliminated, for better or worse. In its place, for the same price, is the 64GB iPad model. This seems like a way to keep selling the 16GB models, which should be long gone, without actually eliminating it. If you're on the fence, Apple made the jump to extra storage a little easier, but not cheaper if you just wanted a little more room above 16GB. International travel with any 4G-connected device is a hassle, but the new Apple SIM card can eliminate at least one overseas-trip headache. Pre-installed in the iPad Air 2 with Wi-Fi + Cellular models, it allows for short-term plans from select carriers in the US and UK. Plans can be selected right on the iPad with no long-term commitments, making it easier to pay for a data plan from a local carrier on a trip. This would be even more meaningful in the next iPhone 6S and iPhone 7, but it's a start.